Miniature dolls can be vastly improved if given the correct hairstyle to suit the doll and the costume. Several materials can be used for wigging, and there are some good online tutorials which will help walk a beginner through the process, depending on which method you prefer to use. Miniature wigs are commonly made from viscose, fine mohair, or Tibetan lamb's wool (used for an easy, natural look) available via online suppliers or specialty stores. Viscose is the shiniest, and some say the easiest fiber for wigs as it is easy to shape into curls (using knitting needles), and is the least likely to frizz. Tibetan lambs wool is useful for long-haired naturally wavy styles. 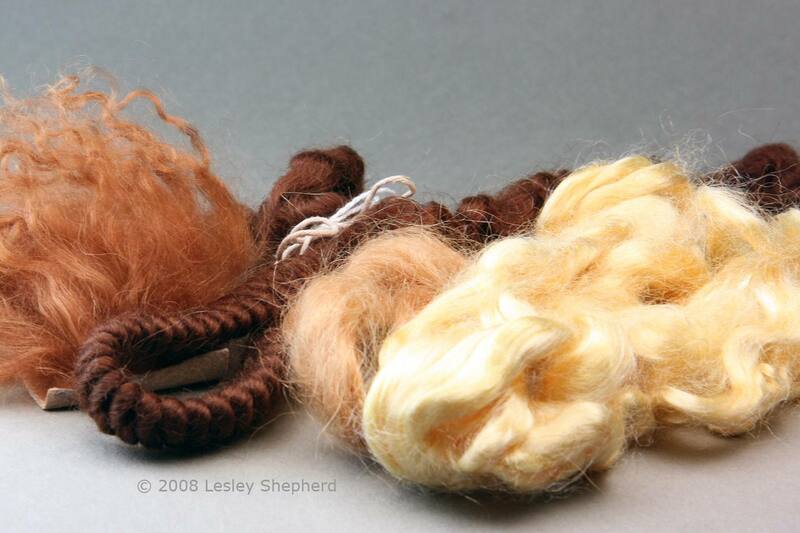 Mohair is most often used as long fibers from hanks, but occasionally doll makers will use the thicker fibers from braids of theatrical mohair (available from theatrical supply shops) which has a natural kink as it has been stored in braids. For some purposes, doll makers will also use silk fiber (tussah), embroidery thread, or wool yarns. Wigs can be made on a cap of plastic film or fine needlework canvas to make them removable. Plastic wrap is held over the doll's head with a rubber band, and hair is glued in place on the film. When the hair is dry, the film is carefully peeled away from the glue which was used to hold the fiber in place, leaving a shaped wig cap of dried glue. Fine needlework canvas (16, 18 or 20 in an ecru color) can also be used. Dampen the mesh with a mixture of water and glue and pull it over a layer of plastic wrap on the doll's head. Hold it in place until it dries using a rubber band. When dry, carefully peel the cap off the plastic wrap and trim it to fit the dolls head. A bead of glue on the edge prevents fraying. Made On or Off the Doll With a Wig Block? Removable wig caps can be made on the doll's head, if you cover it with plastic film held in place with a rubber band, and glue the hair fibers to that. The doll body and costume should be carefully wrapped in plastic while you are working on the wig to avoid damaging or dirtying the costume. If you need several wigs for dolls with similar sized heads or make hats for hat shops, you may find it useful to make a wig block. A wig block can be made from polymer clay by making a rounded section similar in size to a regular doll's head and setting it on a short, cylindrical base. The wig block is also useful for shaping and finishing hats for miniature dolls. Gina Bellous Miniatures Wigging tutorial for an easy woman's hairstyle with a center part. Cynthia Howe Miniatures Wigging tutorial for regency hairstyles. Patricia Rose Studio, using Tibetan lamb's hair in a doll's head with a hole for the hair.